Luc Dratwa, NY Lovers, Paper Enhanced Epson Paper 190 gr. Print on Epson 11880 – Pigment Inkjet – Filter UV, mounted on an ‘inversed frame’. 39 x 59 inches, edition 10. 2009-11. Kasia Kay Gallery is pleased to announce the opening of “NY Tales”, the gallery’s first solo exhibition for Luc Dratwa. Luc Dratwa is best known for his series of photographs taken from the 65th floor of Rockefeller Center with a view of the Empire State Building in New York City, as well as his series taken at the NYC subway. Dratwa captures familiar imagery and contextualizes his subject matter within a fragmented realm of New York City. In essence, he constructs a vision that is his own unique rendition of the city. Throughout his series of photographs, Dratwa catches people as they gaze at the astonishing views. 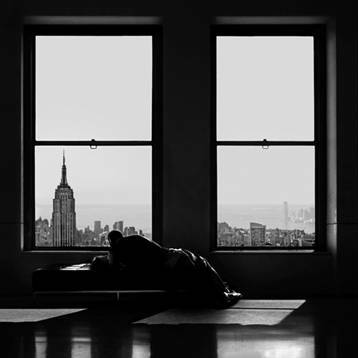 The images consist of three planes: the character, the window and the city, brought together through Dratwa’s lenses. Within the series progression, the characters change and effect different tales of love and motion, but the point of view remains constant as an ode to his love of tamed space. Through this framing the audience is granted a perspective of view that becomes timeless. The “Subway” series – which is devoted to the New York subway – illustrates more clearly than ever his concern for the perfection in construction which leaves nothing to chance. As the fruit of long hours of watching and waiting before the lens shoots that one image, “Subway” captures an underground world from which man is physically absent most of the time. At the same time, Dratwa captures a reality magnified by the poetry of the detail, a reality that generates a perfect balance, a harmony of lines, forms, rhythms and contrasts that is nothing short of faultless. “Subway” shows Luc Dratwa on top form as he masters a portrayal of image and color. This is driven by a total vision which proves that beauty is everywhere, even in the metal framework of a train carriage, the perspective of a tunnel and the light of a deserted platform. Luc Dratwa, Try One, Print on Fujifilm Paper 180gr, Epson Ultrachrome Pigment Ink – Diasec, 19.7” x 47.2”, ed. 10, 2012. Dratwa has a number of influences and believes that he draws inspiration and creative strength from the heritage of Baroque painters and in the work of Edward Hopper, Meyerowitz and even from writers. For Dratwa, every subject he tackles is as much a story as it is a photographic work. “I write stories, where others would translate them into music, poetry or novels. I tell my stories on photo paper”. Dratwa presented “Subway” in avant premiere at Lineart 2011. He received three awards including the Gallery Award and two “Art Lovers” Awards and has been featured in exhibitions in Rome, Paris, Tokyo and New York. Dratwa was born in 1958, and currently he resides in Brussels, Belgium. For more information please contact Kasia Kay at info@kasiakaygallery.com or call 312-944-0408. This entry was posted in Openings and Events and tagged art, Chicago, Kasia Kay Gallery, Luc Dratwa, New York, photography. Bookmark the permalink.